back home » Adobe Tutorials » Introduction To After Effects. When it comes to Videoclips or Film making, Adobe After Effects is the best finishing program. This is exactly what you'll need to expand your creativity. In this tutorial you'll learn the fundamentals needed to get started, using After Effects. And how you can easily use some third party plug-ins to expand your creativity without limitation. We'll work with After Effects CS4. Adobe After Effects, is an application that allows you create motion graphics, animation, compositions, visual effects and more. Whoever worked with Photoshop can easily use After Effects, because whatever can be done in photoshop is also possible in After Effects. Plus manipulation of high quality videos, addition and synchronization of sounds, bringing still images into motion, creation of motional 3D text, and more. 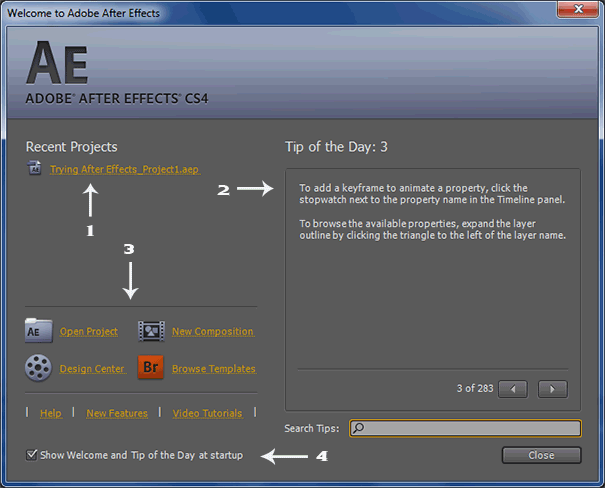 After Effects CS4 Welcome & Tip Of The Day. Now, I'd like to introduce a very helpful tool in After Effects no beginner can go pass it, and this is the welcome to Adobe After Effects dialog box. At any time you'll start After Effects new, you'll be greeted with the welcome & tip of the day dialog, this contains some helpful hyperlinks and tips, very useful for both novice and advance users. Explaining The Welcome Screen Content. In the above illustration I've numbered some important sections I'll like to explain their uses here. In section 1 you'll find buttons to the currently use projects. Section 2 contain Tips that will be very useful at every time you'll need 'em. At the time of this tutorial it was containing up to 283 useful tips [This might change in the course of updates]. It changes at every time you'll start After Effects. You can manually browse through it by using the arrow buttons below, or Search Tips field. [Tip of the day]. In Section 3 you have seven thankful links Adobe knows you can't afford to cease using 'em. The Open Project button is used to open an existing project on your hard-disks, both intern and extern. The New Composition button is used to open the composition dialog, so you can set up and start a new composition. The Design Center button is used to connect to the Adobe After Effects online help sitemap. Here's where you can find button to every topic on After Effects, get inspired by the Adobe design center creations, or exchanging designs with other users. [Internet Access required]. The Browse Template button will start Adobe Bridge, already installed on your system at the installation time of After Effects, unless you chose not to do so. In Adobe Bridge you can browse through a bunch of templates you can use for free, boosting up creativity and fast working. Learn more on Adobe Bridge. The Help button will connect you to the real Adobe After Effects CS4 Online Help site, where you can find help strictly on After Effects CS4. [Internet Access required]. The New Functions' button will connect you to an Adobe web page, where you can find the latest news on Adobe After Effects, being it the newest functions in CS4 or a greater version. The Video Tutorials button will connect you to the Adobe Video Workshop, where you can find lots of video tutorials on almost every Adobe Product. Activating the checkbox in the section 4 will start the welcome dialog box at every time you restart After Effects. You may uncheck this, and manually restart it if needed, under the Menu bar button help. The Three Main Parts In After Effects. Menu, Tool Bar, And Project File Name. Immediately you open After Effects, you'll find the Menu, Tool bar, and the project file name panel locating on the top-left corner of the application window. See illustration below. The Menu bar consist of nine main menu items, and each has multiple items underneath that plays important rolls when using After Effects. [Same as in Photoshop]. The File menu item is used to create a new Project, open and close Project, Import and Export Videos, Images, Sounds, Save Project, Browse Template Projects and more. In the Edit menu item you can Undo, Redo, Cut, Copy, Paste, Duplicate, and do whatever has to be done concerning editing. The most important item under the Edit menu item is the Preferences. Here's where you can setup After Effects to suit your work. In the Composition menu item, you can create a new composition, Set up Composition, Add composition to render queue, Preview, Pre-Render and more. The Layer menu item, allows you create a new layer, either a standard or 3D layer. In general all that has to do with layer is done here. The Effect menu item provides you with a bunch of Effects already in After Effects, and what you'll instal new could also be found here. The Animation menu item is equipped with features you can use to control your animations. Here, you can save animation presets, apply presets, set Keyframe, Browse presets through Adobe Bridge and more. 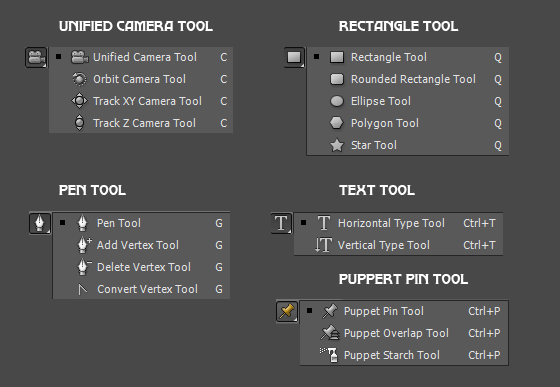 In the View menu item you can Zoom In/Out, Show Ruler, Show Guides, Lock Guides, Snap to Guides, Clear Guides and more. In the Window menu item you can activate or deactivate panels, select a new Workspace or save your customized Workspace for future use. You can assign shortcuts to a Workspace. And at last but not the least, the Help menu item could be used to get Online help, Updates, References, and more, here is also where you can re-call the Welcome and Tip of the Day Dialog. As you can see the Menu Bar offers more features in After Effects. However, that's not all, now let's see also what the Tool Bar got in store for us. There are thirteen tools displaying in the tool bar above, and the following has multiple items underneath, clicking on the arrow at the down-right corner will display the rest tools. After Effects application window is completely based on Frames, and each Frame contain panels with information inside them. Now if you take a look at the application window, you can see, it's divided in to many parts [Frames]. Using drag an drop you can move each frame around, re-arranging the complete window. Anyway, that is another topic, we'll deal with that in the future. Now let's see which frame contains which information. 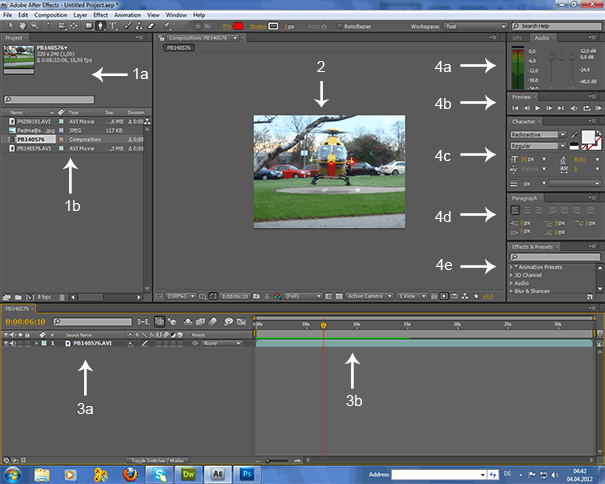 Start After Effects, select the workspace [Text] on the far right side of the tool bar, and follow the numbered arrows in illustration below. In Frame 1, you can find the project panel, 1a displays object information, and 1b contains the project objects. Frame 2 holds the project Composition panel, this is where you can preview the current object loaded on to the timeline. Frame 3 contains the timeline panel, 3a is the location that contains Timeline Objects, Layers, and Transformation Tools. And 3b carries the editable instances of the project objects under a Time Ruler, whiles the Time Indicator runs over it at a playback, enabling the preview in the Composition panel. Keyframes are also added in here. Now, on the right side is a list of Frames and panels. 4a is a Frame containing two panels, Info and Audio. Click on the panel's header to display its content. Frame 4b contains the Preview buttons. Frame 4c holds the character panel, this is the main tool for editing Text, after creating one using the Text tool. Frame 4d contains the Paragraph's panel. This is used to position text, e.g. Aligning text to left, right, center, justify, indenting margin, and so on. And 4e [my favorite] is the Frame that contains the Effects and Presets' panel. Adobe After Effects is a powerful application as we've seen it. It does great jobs. However, there are some serious third party plug-ins and presets that brings its strength to an unlimited range, allowing users expose creativity without hassles. The Red Giant Software, provides many plug-ins for After Effects, Premiere and more. I'm not going to write a whole story about this, you just visit RedGiantSoftware.Com and testify their products yourself. Note This: Red Giant has introduced, what they call FREE FRIDAY. On every Friday you can get tutorials from some Gurus out there, including presets to download, and all for free. Meet me there. Video Copilot is another great site that produce very useful plug-ins, presets, stunning After Effects tutorials, and files for free download. Adobe After Effects Pro CS6. Adobe After Effects Pro CC.